If you order a case of 28 books or more books, make sure you enter the Coupon Code "CASE" on your order form. That way, you will get a 15% discount off the cost of your order. If you order between 10 and 27 books, make sure you enter the Coupon Code "BULK10" on your order form. That way, you will get a 10% discount off the cost of your order. If you order between 5 and 9 books, make sure you enter "BULK5" to receive a 5% discount on your order. 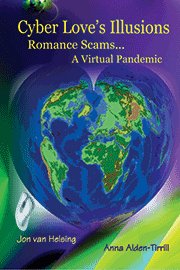 Do you belong to the Yahoo RomanceScams Group? If so, contact one of the moderators to learn about special order discounts available only to group members. Are you a member of local, county, state, or federal law enforcement? E-mail us at our law enforcement link to take advantage of special order discounts for the law enforcement community. Has your Counseling Group encountered any Romance Scam victims? Contact us at out counseling link to take advantage of special order discounts for the Counseling Community. Click on This Link to Go to Our Special Combo Deals!